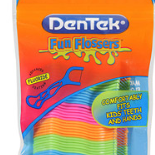 Hurry over to score a FREE Sample of DenTek Flossers (click anywhere, keep clicking the videos, randomly answer the questions). Afterwards, click the gift box to request your sample. Allow 8-10 weeks for delivery!